From time to time I find myself feeling stressed not so much by a major issue but lots of little things that seem difficult to manage. Sure, life is complicated these days but there are some aspects I am able to do something about. 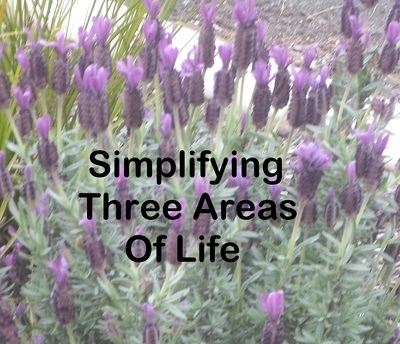 Three areas of my life I am working on simplifying are clothing, kitchen and the garden. Like many people I tend to have more clothes than I need. Some 'experts' say many women wear 20% of their wardrobe 80% of the time. This sounds quite possible to me. I have been working on having only clothes that I love and actually wear. I feel guilty about not wearing things I own. Now I need to avoid buying unnecessary clothing, even if it is an absolute bargain. Years ago I owned two dinner sets and multiples of other items. I have culled numerous thingsincluding unnecessary salad bowls and serving platters and I find this works better for me. It is easier to find things and I don't have china and glassware stacked in hard to get at spaces. Is this item useful in my current lifestyle? If I part with this item but found I did need it in a couple of years time, could I replace it easily and cheaply? My next project is to reconsider the things in the pantry cupboard. For example, there are some spices I no longer use as my taste has changed. It is easy to continue to keep things out of habit without thinking if they are still useful. I love spending time in the garden, especially sitting and thinking or watching the birds. Yes, I enjoy gardening but sometimes I complicate things and then it isn't as enjoyable. At times I have planted herbs I never use. Sometimes this is fine because they have pretty flowers or their leaves smell nice when brushed against. Sometimes it would be better to replace them with something else which I will use or which is easier to maintain. Perennials tend to be less work than annuals so in future I plan to concentrate more on them. Some of the plants in my front garden died during the hot weather so I will replace them with hardy vegetation which should survive the next summer. 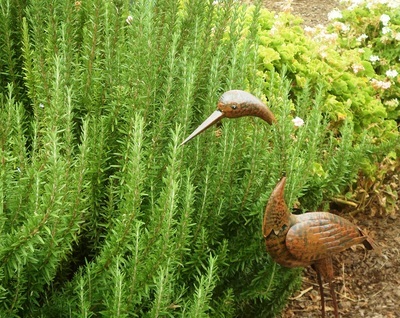 I have found lavender and rosemary grow very well in my garden so I will be planting more. I have reduced the number of pots as they tend to be fiddly and require frequent watering in summer. These days I have a few large pots rather than lots of small ones. Some things that worked for me when I was younger now seem like unnecessary work. These are things I can simplify to make life easier and to give me time to sit and watch the birds in the garden.